I’m all for colour (in moderation of course) and Smeg has done it again. We are all familiar with their colourful fridges that were the height of fashion in the 50’s which then became rather uncool as we all replaced them with stainless steel fridges. Not so long ago Smeg reintroduced them in super trendy colours and they became ‘THE’ fridge to have again. Now, Smeg has risen the bar and introduced colourful stoves. How wonderful! This entry was posted in Blog and tagged Colourful fridges, Colourful stoves, fridges, kitchen, Smeg. 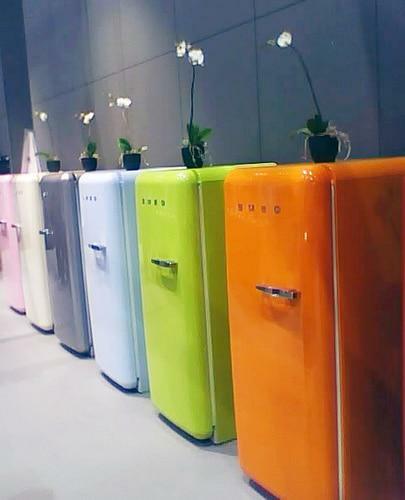 Wow…that are cool coloures of fridges! I love it!Great!Such colourful fridges bring good mood to every boring kitchen! I love smeg products… they also do dishwashers. I’ve been lusting after one of those for AGES!